Orders may take between 1-3 business days to process before shipping out. After orders are captured in our system, if you would like to make any changes to your order or cancel your order, please call our Client Care Representatives at 1-800-581-2001 or email at orders@wigs.com. Our Representatives are available during our business hours of 8:00am - 6:30pm (CST) from Monday - Friday (excluding holidays). Note: Once your order’s status is set to “shipped” we are unable to make any changes or cancellations. Once shipped, orders arrive within the time frame selected (US Ground, US Air, US Express, Canada Air or International) during checkout on Wigs.com. If there are any shipping delays, you will be notified via email. Incorrect billing information and/or shipping to an alternate address may cause shipping delays and additional charges. Any typographical, photographic, or specification error in products or pricing is subject to correction. We will notify you of any corrections or changes and ask for your approval before we complete your order. All Credit Card charges will appear as Beauty&Hair for your privacy. Packages will ship from Beauty & Hair. For your convenience, we also accept cashier's checks and money orders. No personal checks, please. *In order to comply with PayPal’s best practices standards, all orders placed using PayPal will be captured within 24-48 hours from the order placement. For the most efficient service, please be sure to register an account with us! Go to www.wigs.com. If you are using your phone or tablet, click on the ‘Account’ button located under the Wigs.com logo. If you using a desktop or laptop, click on the ‘Account’ button located above the search bar on the righthand side. Follow the login prompt by entering your email and password. Once you’ve logged into your account, under the ‘Order History’ section and click on the Order you are wanting to track. If your order has shipped, a UPS or USPS tracking number will be added under the Product information. Once your order has shipped, you will also receive email updates from UPS or USPS with shipping and tracking information to the email address you used to place your order. Orders may only be modified within 2 business hours from being placed as long as your order’s status is not set to “shipped.” Wigs.com begins processing very quickly in order to ship as soon as possible. If you would like to make any changes to your order or cancel your order within the 2 business hour time frame, please call our Client Care Representatives at 1-800-581-2001 or email at orders@wigs.com. Our business hours of 8:00am - 6:30pm (CST) from Monday - Friday (excluding holidays). If you find any item we carry at a lower price on a competitor's website, Wigs.com will match the competitor’s price. The competitor must be an authorized US internet retailer advertising the identical product online. The product must be advertised on the competitor’s website not by email or written price quote and must not include any discounts or coupons. Since wigs.com only sells unopened items, we will not match competitors’ bonus or free offers, special offers, rebates, clearance or closeout prices, or prices on used, damaged, returned, open box or display merchandise. Price matching cannot be combined with any other coupons or offers. Price matching can be completed by our Client Care Representatives before you purchase or within ten (10) days of your purchase. To request a price match simply call our Client Care Representatives at 1-800-581-2001 or email hello@wigs.com during our business hours of 8:00am – 6:30pm (CST), Monday – Friday (excluding holidays). Occasionally backorders occur when requests for a particular item exceed available inventory. If a backorder occurs on your ordered product, we will contact you via email with the estimated arrival date of your product and you will be given the option to: (1) select a new item, (2) request to be placed on a priority waitlist to receive the product once it becomes available for shipment (Note: we will complete the charge to the payment method used with your original order), or (3) cancel the original order. If we do not hear back on which backorder option you choose, backorders are canceled after 80 days and credited back to their payment source. We will promptly ship the item(s) once they become available with the original shipping method selected at checkout. For international orders containing multiple products, we do not ship partial orders. Therefore your order will be shipped when all products ordered are available, unless you advise us otherwise. For more information, please contact us by phone at 1-800-581-2001 or by email at orders@wigs.com. Discounts and coupons are limited to one per order (i.e. you cannot use a sale coupon code in combination with your points coupon code in the same order). Color rings and donations are excluded from all discounts. Wigs.com eGift Cards expire after 5 years, and the number may be used to purchase any merchandise online at Wigs.com. Coupons and other discounts may not be used to purchase eGift Cards. If purchase exceeds the value of an eGift Card, a credit card may be used to complete the order. Value may not be added back onto an eGift Card, nor can it be redeemed for cash or applied as payment or credit to a credit card account. When purchasing with a Wigs.com eGift card number, the value of the purchase plus any shipping fees and sales tax, if applicable, will be automatically deducted from the giftcard. Remaining balance may be checked by calling 1-800-581-2001. Recipient's email address will be used solely for the delivery of the eGift Card. Delivery to an incorrect or invalid email address is the responsibility of the purchaser. It is important to safeguard the Wigs.com eGift card number. The bearer is responsible for its loss or theft. If an eGift Card is lost or stolen, and there is proof of purchase, we will issue a replacement for the balance shown in our records and send to the same email address used for the original eGift Card purchase. Deliveries to APO/FPO/PO boxes cannot be time-frame guaranteed nor can the package be tracked. We recommend all deliveries be made to a physical address so packages can be tracked and delivered correctly. *All shipping promotions apply to US Ground shipments only. Note: US Air shipping is the required option for Hawaii, Puerto Rico, and Alaska – US Ground shipping is not an option. **Wigs.com is not responsible for any duties, taxes, or additional charges that may be charged by Customs for international deliveries. Any refused international packages (including Canada) will only be refunded 50% of the total order amount. Note: Ellen Wille items may only be shipped within US & Canada; International shipping not available for this brand. Signature Required Note: While Wigs.com requires a signature for clients to accept shipments/orders over $500, the client can have that waived through UPS My Choice. However, we do not recommend waiving the signature requirement because if the package is lost you have waived all liability; therefore, UPS cannot do a trace investigation to locate or recover the package. For shipments returned to Wigs.com due to bad address information or refusal upon delivery, there will be a $20 fee automatically charged. Shipping and handling charges are non-refundable in the event of a return of any kind. This applies to US orders only. Shipping delays may occur due to holidays, natural disasters, or carrier delays. Please keep in mind holidays and weekends do not count as business days and should be considered when calculating shipping times. If you need additional information, please email orders@wigs.com. If you are concerned with weather delaying your order, check the Service Alerts page on UPS or USPS for updated notices about shipping delays due to weather. Wigs.com is required to collect sales tax in accordance with each states’ respective sales tax laws. The appropriate charges will be added to your order total during checkout and displayed on your final order confirmation. If you have questions about your state’s sales tax, please contact your State Tax Agency. Your satisfaction is our goal. We accept returns on all eligible products within 30 days from the date the order is shipped. Please see our Return Policy below for our eligible product standards. We will gladly accept returns on all eligible products where the product or packaging has not been altered, worn, or damaged no later than 30 days of the shipping date. Store Credit – No fee is charged if you return your item for store credit to be used on a future purchase. Store credits cannot be refunded to a credit or debit card. Refunds will be processed within 3 to 5 business days from receiving your return. Typically, financial institutions will process within 3 to 9 business days. Please note: your bank may have a delay in processing your credit back to your account. Updated February 2019: We've upgraded our Returns Method - visit www.wigs.com/returns to initiate your return online. Any other address used will put your item at risk for getting lost in the mail, sent to the wrong company, or delaying your refund. Wigs.com gladly accepts return of all eligible products no later than 30 days from the date of shipping. Altered packaging/product, worn, or damaged items are not eligible for return. In original factory condition (unaltered, unworn, undamaged, containing no odor or signs of wear or styling product). Must have tags attached and in original packaging. Item(s) must be returned within 30 days of the shipping date of the order. Worn items or items containing any signs of wear including odor or styling product. Damaged packaging or product as well as discontinued, closeout, and last call items. Hair Care items (including BeautiMark products) are not eligible for return if they have been removed from their original packaging (i.e. bubble wrap). Charity donations added at checkout are not eligible for return/refund. Ineligible products received by Wigs.com will be returned to you at your expense. NOTE: We provide a complimentary wig cap in each shipment for hygienic purposes. This helps to maintain the product’s eligibility for return. In the event you return any wigs, please keep the cap as a gift from us to you. Wigs.com reserves the right at our discretion to make changes to these policies at any time. Please check this page periodically for changes. Wigs.com respects and protects the privacy of our users. For your privacy protection, all packages will ship from Beauty & Hair. The word Wigs will not appear on the package. In an effort to provide the best service to our clients, Wigs.com periodically sends out special offers and discounts via electronic notice (email). At any time, you may unsubscribe to our notices by clicking the Unsubscribe link at the bottom of Wigs.com emails or by sending an unsubscribe email to hello@wigs.com. Additionally when you make a purchase or attempt to make a purchase through the Site, we collect certain information from you, including your name, billing address, shipping address, payment information (including credit card numbers, email address, and phone number. We refer to this information as “Order Information”). If you are a European resident, you have the right to access personal information we hold about you and to ask that your personal information be corrected, updated, or deleted. If you would like to exercise this right, please contact us through hello@wigs.com to request your information. alert you to new information and products, promotions and services that we offer. (a) Registration and Ordering. Before using certain parts of any Site or ordering products, you must complete an online registration form. During registration, you will be prompted to provide to us certain personal information, including but not limited to your name, shipping and billing address(es), phone number, email address, and credit card number. In addition, we may also ask you for your country of residence and/or your organization's country of operation, so we can comply with applicable laws and regulations. This kind of personal information is used for billing purposes, to fulfill your orders, to communicate with you about your order and the Sites, and for internal marketing purposes. If we encounter a problem when processing your order, your personal information may be used to contact you. (b) Email Addresses. Several locations of the Site permit you to enter your email address for purposes including but not limited to: to register for a contest or sweepstakes; to request alerts which will notify you of new brands, new product styles, or other new products; or to sign up for email newsletters and special offers. Your participation in a contest or sweepstakes is completely voluntary, so you have a choice whether to participate and disclose information to us. We use this information to notify contest and sweepstakes winners and to award prizes. We may post on the Site the names, cities and states, photos and/or videos of contest and sweepstakes winners. By entering a contest or sweepstakes, you will be opting in to receive our email newsletter and special offers. This will be disclosed in the official rules governing the contest or sweepstakes. (c) Phone Numbers for Order Notifications and Text Marketing (if applicable): By entering your phone number in the checkout and initializing a purchase, you agree that we may send you text notifications (for your order, including abandoned cart reminders) and text marketing offers. Text marketing messages will not exceed 2 per month. You can unsubscribe from further text messages by replying STOP. Message and data rates may apply. (d) Cookies and Other Technology. Like many sites, the Site employs cookies and web beacons (also known as clear GIF technology or "action tags") to speed your navigation of the Site, recognize you and your access privileges, and track your Site usage. (f) Age. The Site is a general audience site. Protecting children's privacy is important to us. By using the Site you represent and warrant that you are either 18 years of age or older,or using the Site with the supervision of a parent or guardian. If you are under the age of 13, please do not submit any personal information to us, and rely on a parent or guardian to assist you. We do not knowingly or intentionally collect personal information from children under age 13. (a) Internal Use. We use your personal information to process your order and provide you with customer service. We may internally use your personal information to improve the Sites' content and layout, to improve outreach and for our own marketing efforts (including marketing our services and products to you), and to determine general marketplace information about visitors to the Site. In order to facilitate such use and the other use described in this Section 2, we may share your information with affiliates under Beauty and Hair's control. (b) Communications with You: We will use your personal information to communicate with you about the Site and your orders and deliveries. Also, we may send you a confirmation email when you register with us. We may send you a service-related announcement on the rare occasions when it is necessary (for example, if we must temporarily suspend our service for maintenance.) Also, you may submit your email address for reasons such as to register for a contest or sweepstakes; to request us to notify you of new brands, new product styles, or product sizes; or to sign up for email newsletters and special offers. If you submit your email address, we use it to deliver the information to you. We always permit you to unsubscribe or opt out of future emails (see the opt-out section, below, for more details). Because we have to communicate with you about orders that you choose to place, you cannot opt out of receiving emails related to your orders. (i) As do most catalog and Internet retailers, we sometimes use others to perform specific functions on our behalf. When we disclose information to these service providers, we disclose information to help them to perform their service. For example, in order to deliver products to you, we must share some information. We partner with third parties (such as United Parcel Service and the United States Postal Service) to ship products, to ensure delivery, and so that we can obtain feedback, improve the quality of our service, and measure and improve the quality of the service of the third party. In the example of shippers, we provide them some personally identifiable information such as your name, shipping address, email, and phone number. (vii) We may publicly disclose the names, cities and states, photos and/or videos of the contest and sweepstakes winners. To ensure your shopping experience is safe and secure, our site is designed to use 128–bit Secure Socket Layer (SSL) encryption. This encryption keeps your personal information, including your credit card, secure from theft. Our site is also actively monitored 24/7 to make sure that we are always open, safe and ready for shopping. Upon your request, we will (a) correct or update your personal information; (b) stop sending emails to your email address; (c) disable your account to prevent any future purchases through that account; and/or (d) remove your saved credit card information. You can make these requests by telephoning, or emailing your request to Wigs.com's Client Care Representatives 1-800-581-2001 or hello@wigs.com. Thank you for visiting the Wigs.com Website operated by Beauty and Hair Products International, LLC ("Beauty and Hair") and its Affiliates. "Affiliates" includes any other entity controlling, controlled or under common control with Beauty and Hair, where "control" means the possession, directly or indirectly, of the power to direct the management of an entity, whether through voting securities, contract or otherwise. Wigs.com reserves the right to place customer accounts on hold or block customers due to missuse of terms. Unless otherwise noted, all materials on this Site, including text, images, illustrations, icons, photographs, video clips and other materials, and the copyrights, trademarks, service marks, trade dress and other intellectual property in such materials ("Content") are owned, controlled or licensed by Beauty and Hair and its Affiliates. Content is provided solely for your personal, noncommercial use. No right, title or interest in downloaded Content is transferred to you as a result of any such downloading or copying. You may not reproduce (except as noted above), publish, transmit, distribute, display, modify, create derivative works from, sell or exploit Content in any way. We reserve the right to pursue all legal remedies for any commercial exploitation of Content. Any comments, reviews, suggestions, ideas, images, videos, submissions or other communications submitted or offered to us ("Your Comments") will be and remain the property of Beauty and Hair. Submission of Your Comments, whether via email, postal mail, or otherwise, will constitute an assignment to Beauty and Hair of all worldwide rights, title and interest to all intellectual property rights in Your Comments. We will be entitled to use, reproduce, disclose, publish and distribute Your Comments (or any part thereof, in edited or modified form) for any purpose whatsoever, without compensation to you. You agree that: Your Comments will not violate rights of any third party, including but not limited to, copyright, trademark, privacy or other personal or proprietary rights; Your Comments will not contain libelous, threatening, defamatory or otherwise unlawful, abusive or obscene materials; and you will not transmit any computer virus or other malware that could affect operation of our Site. We attempt to display the products featured on our Site as accurately as possible. However, we cannot guarantee that your monitor's display of merchandise color, texture or detail will be accurate. On occasion, the Site may contain incomplete information, typographical errors, or inaccuracies as to description, pricing, promotions, sizing, fabrication, color or availability. We reserve the right to correct errors at any time without prior notice (including after your order has been placed). Prices are quoted in U.S. Dollars and are valid only in the United States. We reserve the right to change pricing at any time. The content provided on this Site (including Content and Your Comments) is solely for informational purposes. It is your sole responsibility to consult a licensed physician or qualified health care professional for advice, diagnosis, and/or treatment of any health related condition. Submissions or opinions expressed on this Site are that of the individual expressing such submission or opinion and may not reflect our opinions. This Site may be accessed from countries other than the United States and may contain products or references to products that are not available outside of the United States. Any such references do not imply that such products will be made available outside the United States. If you access and use this Site outside the United States you are responsible for complying with your local laws and regulations. Title to the items purchased and therefore the risk of loss pass to you upon our delivery of the items to the carrier pursuant to our standard terms of sale. We may assign you a password and account identification to enable you to access and use certain portions of this Site. Each time you use a password or identification, you will be deemed to be authorized to access and use the Site in a manner consistent with the Terms, and we have no obligation to investigate the authorization or source of any such access or use of the Site. YOU WILL BE SOLELY RESPONSIBLE FOR ALL ACCESS TO AND USE OF THIS SITE BY ANYONE USING THE PASSWORD AND IDENTIFICATION ORIGINALLY ASSIGNED TO YOU WHETHER OR NOT SUCH ACCESS TO AND USE OF THIS SITE IS ACTUALLY AUTHORIZED BY YOU, INCLUDING WITHOUT LIMITATION, ALL COMMUNICATIONS AND TRANSMISSIONS AND ALL OBLIGATIONS (INCLUDING WITHOUT LIMITATION FINANCIAL OBLIGATIONS) INCURRED THROUGH SUCH ACCESS OR USE. You are solely responsible for protecting the security and confidentiality of the password and identification assigned to you. You shall immediately notify us of any unauthorized use of your password or identification or any other breach or threatened breach of this Site's security. This Site may contain links to websites owned and controlled by third parties. These links are provided solely for your information and convenience. We have no control over or responsibility for third party websites which you use at your own risk. This Site and Content are provided on an "as is" basis without warranties of any kind, express or implied, including without limitation, implied warranties of merchantability, fitness for a particular purpose, or non-infringement of intellectual property. We disclaim any duty to update or revise Content although we may modify Content at any time without prior notice. Your use of this Site is at your sole risk and you assume full responsibility for any associated costs. We will not be liable for damages of any kind related to or arising out of your use of this Site. You agree to defend, indemnify, and hold Beauty and Hair (including their officers, directors, employees and agents) harmless from and against any and all claims, damages, costs and expenses, including attorneys' fees, related to or arising out of your use of the Site and/or your breach of the Terms. In the event of any claim, action or dispute related to or arising out of any Wigs.com transaction, your use of this Site, or the breach, interpretation or validity of the Terms, ("Dispute"), the party asserting the Dispute will first attempt to resolve such Dispute in good faith, by providing written notice to the other party (via certified mail, return receipt requested or express delivery carrier) describing the facts and circumstances (including any relevant documentation) and allowing the receiving party at least thirty days in which to respond to or resolve the Dispute. If to Beauty and Hair, notice will be sent to Beauty and Hair, Attention: Legal Department, 12001 N. Central Expressway, Suite 950, Dallas, Texas 75243. If to you, notice will be sent to your last used billing address or the billing and/or shipping address in your online profile. Both you and Beauty and Hair agree that this dispute resolution procedure is a condition precedent to the filing of any litigation against the other. Any claim or action initiated by you related to or arising out of your use of this Site or the Terms will be resolved only by state or federal courts located in Dallas County, Texas. The Terms will be construed in accordance with the laws of the State of Texas, without regard to any conflict of laws provision. Waiver of any of the Terms will not be deemed a waiver of any other Terms or of our right to require strict adherence to any Terms at any time. If any Terms are deemed unenforceable or invalid for any reason, that provision will be severable from remaining provisions, which will remain in full force and effect. These Terms constitute the entire agreement between us relating to your use of this Site. There are advantages to both and many people choose to have human hair and synthetic hair wigs on hand for different circumstances. Human Hair offers the most natural look and feel as well as styling versatility. While typically more expensive, with proper care, human hair can last over a year. Synthetic hair tends to be a more affordable choice and offers great ease of wear — wigs can often be worn right out of the box with little or no styling. 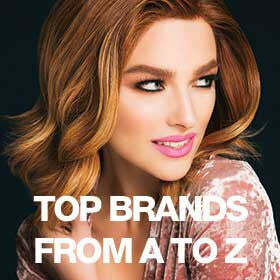 If you enjoy styling versatility, human hair or heat-friendly synthetic hair are the way to go. While human hair offers the most natural look and feel plus styling versatility, heat-friendly synthetic hair also allows heat styling (optimal temperature of 250-275 degrees — never go above 350 degrees). Proper care is vital to keeping heat friendly hair looking its best. A wide tooth comb should be used (not a brush) and it is best to avoid combing while wet. Use of product specially designed for synthetic hair, such as BeautiMark, can also help maintain the quality and condition of the hair. We also recommend detangling spray! With proper care, heat-friendly synthetic hair should last up to a few months. What are the different types of wig cap construction? Constant innovation in technology allows for increasingly wearable and comfortable wigs! The base of any wig is referred to as a cap. The hair is attached to the wig cap using a variety of techniques to achieve different looks. On most wigs, hair is attached in "wefts." These are strips of hair doubled over and sewn closely together in long strands. Others are hand-tied for the most natural movement. If you like to wear your hair swept away from your face, lace front wigs are the best option. If you like parting versatility, we recommend full monofilament wigs. 100% Hand-Tied and double monofilament wigs are known for being gentle on sensitive scalps. How do I figure out my wig size? Many wigs come in petite, average and large sizes. Average size wigs, however, tend to fit about 95% of customers. We have a guide that will help you measure your head to determine the best size! How should I go about choosing color? We aim to make shopping for the right color online just as easy as in a store (or easier)! After you have found a style you like, it is time to check out your color options — there are often dozens. If you are new to wigs, consider staying close to your natural color (you can always have fun experimenting with color later). Only at Wigs.com will you find the TruColor™ approach to displaying color options. We capture our TruColor™ images in an extremely controlled studio environment making them the most consistently accurate available. You can also order color rings or make use of our expert color consultation services by submitting a photo or hair swatch (just download this form). Are color swatches 100% accurate? Hair color images are presented to give you a visual representation of color options for each item. However it must be noted that on screen representations do not necessarily precisely represent actual colors due to variable monitor calibrations. Additionally, the computer or device you use may have an impact on how colors appear. For example, Apple products tend to make colors appear slightly warmer. Wigs.com is proud to offer the most accurate color representation available with our TruColor™ program.